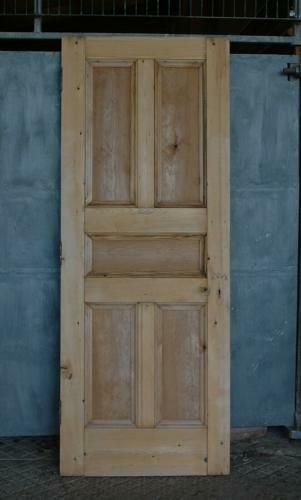 An attractive and solid reclaimed internal Edwardian pine panelled door. The door has five large panels with mouldings surrounding each one. The pine has been stripped and the door has a good colour and grain. The door is ready for finishing by purchaser with either a wax, oil or paint finish. The door is reclaimed and therefore has some slight damage and cosmetic signs of wear. There are some holes and marks where the door hardware has been removed. There is some splintering and knocks to some edges. There are some small wood knots, very thin surface splits and a small amount of damage to one piece of moulding. Door hardware will need to be supplied by purchaser. The door is very well made and is a good example of Edwardian design, perfect for adding character to a home.